Floors see all types of wear and tear. They literally get walked all over. And, no one wants to show off a home with dirty flooring. No matter if you have carpets, tile, or hardwood, with time, there will be routine maintenance needed to keep them looking nice and clean. To help you keep flooring looking nice and clean year-round, we’ve come up with a few quick cleaning tips to help with all types of flooring. Hardwood flooring is beautiful, yet expensive. So, if you come across stains or marks, don’t fret. There are a few quick cleaning tips to help you get your flooring back to the same beautiful state it was when it was first installed. Permanent Marker: For families with kids, this trick is one that should be remembered for years. If you find any permanent marker marks on your flooring, don’t start purchasing area rugs just yet. Instead, take a damp cloth with a dollop of toothpaste to the area. Move in a circular motion until marks have come up. Water Marks: This is one of the most common stain types seen on hardwood flooring. When water sets on wood, it can expand and even change the appearance of color, resulting in a greyish-white spot. To address these marks, take a dry cotton rag and iron the spot with a clothing iron. Then, dab the area with a new cloth dipped in denatured alcohol. Other Stains: For stains which aren’t caused by permanent marker or water on hardwood floors, hydrogen peroxide does the trick. Wet a cloth with the substance and place on the marked area for about 5 minutes. This helps to draw the stain out and soak into the cloth instead. Carpeting can hold moisture, making it a constant battleground for you and stains. But, there are a few quick cleaning tips to help you keep your carpeting for many more years to come. Red Wine: Stains on lighter colored carpets from red wine may seem like a carpet owner’s worst fear. But, there is something you can do about them. The first thing anyone should do if they spill red wine on carpeting is to immediately address the problem. First, use a white wine to water the red wine down and make soaking the moisture up easier. Then, use a rag or sponge to try to get all the moisture you can from the carpeting. Once you’ve gotten all you can from the carpet, sprinkle salt over the affected area to soak up more as the carpet dries. Dark Spots: Other stain issues with carpeting can be addressed with a mixture of salt and white vinegar. Pour the concoction over the stain and let soak before attempting to take the stain up with a cloth or a sponge. 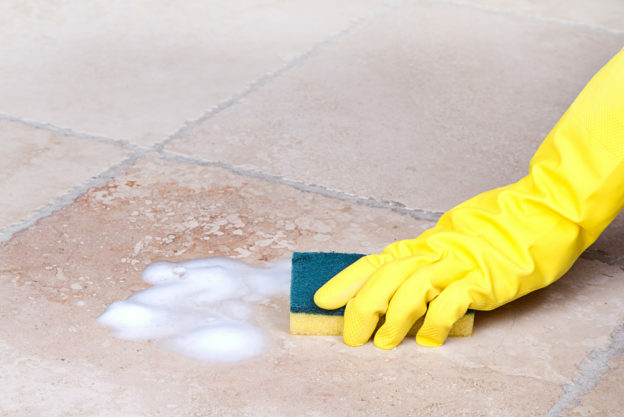 While stone and tile flooring is more easy to keep clean as they don’t hold moisture as much as hardwood or carpeting, there are some instances you’ll need some quick cleaning tips to help with maintenance. Gum: One problem tile or stone owners may come across is gum. To address gum on flooring, try loosening the sticky substance by placing an ice cube over the area. This hardens gum, making it easier to remove with a razor blade or scraper. Grout: Undoubtedly, one of the biggest hassles of owning tile is keeping grout looking fresh. To get a new, clean look on grout, mix lemon juice and shaving cream in a spray bottle. Spray the grout and allow to sit for about 10 minutes. Then, go around and scrub the mixture into the grout with an old toothbrush before wiping up with a wet rag. If you can’t seem to find that anything works with maintaining a better appearance of flooring, it may be time to invest in new flooring. Here at Dustbusters Floor Removal, we can help you get rid of your flooring in a day! And, when we’re done, your new floor will immediately be ready for install! To learn more about the process of floor removal and all involved with our services, visit our website or give us a call today at 866-883-8783.